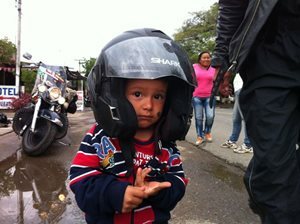 Motorcycle helmets save lives. 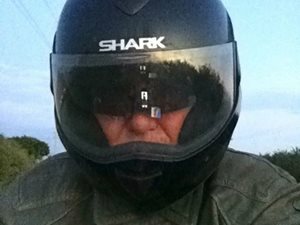 I know this for a fact, because a helmet saved my life about 10 years ago when my straight-on collision totaled not only the motorcycle I was riding but also the Toyota Corolla that I hit dead center. The Corolla was coming around a blind curve from the other direction. I was spared serious injury despite head-first contact with the windshield and also – after flying high over the car – a head-first landing on the road below. More recently, during he first leg of this trip, my life was spared again in a crash that began with my bags breaking loose, causing me to run off the road at about 80 MPH. Suffice it to say, I believe in helmets. Especially full-face helmets. 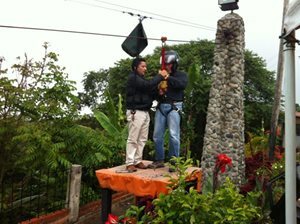 They can be used if a Zip-line happens to be at a roadside rest stop in Colombia, South America. 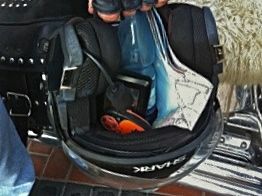 Or a helmet can be used for carrying things like maps, GPS devices, satellite trackers (orange in the photo), water bottles, gloves. Whatever! It’s true, a helmet can be a purse! Although, for a male rider I suppose it’s called a murse. Another great use of a helmet is for singing – hypothetically, mind you. The acoustics inside a full helmet are akin to a concert hall or cathedral. And unlike, say, singing in the shower, there is absolutely no danger anyone else would ever hear. With a full-face helmet at speeds above 50 MPH, one can sing loud and as long with no fear of detection. One might pass hours on the road with full-throated renditions of such things as The Star Spangled Banner; hymns like Amazing Grace; show tunes from Oklahoma!, Fiddler on the Roof, or The Music Man; college fight songs like Boomer Sooner; soulful classics from the Ink Spots; or, maybe best of all, that great 1962 doo wop classic The Duke of Earl (underlying bass, melody, and falsetto parts randomly intermixed). And since nobody else could possibly hear, there wouldn’t even be a requirement to know all the words. 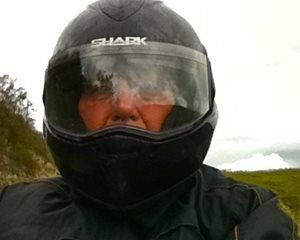 I could even have been singing when I took this photo of myself while riding. That is, IF a helmet were to be used that way. Hypothetically that is. And the best use of a helmet could be for making a friend.